Earthquakes are felt by people somewhere on the globe just about hourly (see this USGS list of felt earthquakes in just the last 24 hours). Some places are particularly prone to them–think Japan, Indonesia, Chile, Italy, California–while some stable parts of the continents will go generations, or even millennia, without anyone there feeling any quaking of the ground. But even in, say, California, where “felt” earthquakes occur daily, most individuals go months or years between feeling little temblors. In fact, despite the huge numbers of people that are affected by major quakes around the world, only a relatively small portion of the Earth’s population will ever actually experience the violent shaking at the heart of an earthquake. So what is going on? How come there can be so many earthquakes, but it’s so rare to feel one yourself? How come even in places that have been struck numerous times by damaging earthquakes, several generations of local residents can forget the destructive impacts of these disasters? The USGS map below, compiled from eyewitness accounts of earthquake shaking submitted online, shows just where in the world shaking of different intensities has been experienced in just the last quarter-century. The rough coincidence of high seismic hazard with high human population is a real phenomenon, but a subject for another post. For now we’re still stuck on the fact that for all this shaking around the planet, very many of you won’t have felt much–if any–of it. In part, this is because the large earthquakes are indeed few and far between, and the much more common smaller quakes affect only small, local areas–more likely to hit a neighboring region than yours. A magnitude 3 earthquake “in Los Angeles” for example, can be weakly felt within a radius of something like 30-40 miles–smaller than the entire size of the sprawling L.A. metro region, so many residents won’t be exposed to a quake that’s nominally within their region and reported on their morning news. For a small number of you, it’s because there haven’t been any earthquakes perceptible where you are… but as this map of shaking in the US illustrates, there are relatively few places that haven’t been subjected to any shaking in a generation, and that portion decreases when you consider longer time spans. Even here in the comfortable, earthquake-spare United Kingdom, pretty much the whole nation of England has experienced light to moderate shaking in the past decade. But there are still plenty of individuals who didn’t. In fact, a big reason many people don’t feel earthquakes is that they’re simply not situated well enough during the shaking. Alternatively framed: they’re within the perceptible radius of the quake, but are not paying enough attention. Below a certain threshold of jarring conspicuousness, earthquakes may rattle unnoticed by people in motion or in loud environments. 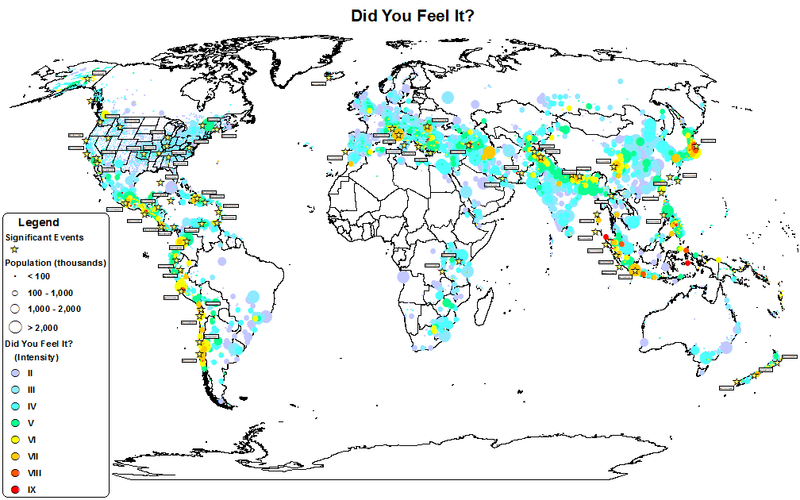 Indeed, that’s one of the specific qualifications that formally discriminates among lower levels of shaking intensity: “felt by few,” “felt by many,” “felt by nearly everyone,” “felt by all.” Thanks to the wealth of data now collected from internet quake-reporting surveys, earthquake scientists can formalize some of the conditions that suppress–or enhance–perception of shaking. Most are intuitive and well known: higher motions on the upper floors of swaying buildings increase the shaking intensity and/or improve your chances of feeling a quake at a given site; being at rest, and of course in a quiet room or space obviously improve your chances; being inside rather than outside, where there are plentiful objects to generate rattling noise will increase the likelihood of noticing a small earthquake, or discriminating it from simply a passing truck. During the large Chino Hills earthquake at the end of my undergraduate days, a friend of mine walking outside along the street toward the gym was entirely oblivious to the substantial shaking that emptied the buildings around her. In contrast, the house in the video below, filled with furniture and things, assures full awareness of every little magnitude 2-3 tremor that rattles through. At low levels of shaking there are also just random-chance variations in awareness that can drive the binary division between felt and not felt. I’ve been in a silent classroom of 30 test-taking students during a 2.5 earthquake, and we were divided in half by a dispute over whether anything had even happened (I was on the winning side; it had). Take a look at the patchwork of “felt” and “not-felt” responses around this magnitude 6.6 earthquake in northern California, and try to delineate the boundary. Scientists generally want to distinguish between an absence of data and actual null results (the distinction between not reporting anything and reporting nothing). Thus conventional analysis of Did-You-Feel-It reports has taken the cautious approach of not attributing a definitive intensity of “not felt” to areas around an earthquake from which no reports were received. That has left scientists in the predicament that they can’t say definitively where ground motions were too small to be perceived. A cool new study published in Seismological Research Letters has proposed a method to use the shrinking proportion of reports to better constrain ground motion, and to enable the inclusion of non-reporting areas as “not felt” areas. The crux of the new study is a weighting scheme that accounts for the proportion of a population that would be expected to respond to DYFI after experiencing a particular level of shaking. In the new strategy presented by Boatwright and Phillips (2017), a “not felt” value can be inferred in non-reporting areas and given a weight based on the population, only if you apply a similar population-based weighting in areas with DYFI responses, in order to account for underreporting due to weak shaking. The rate of underreporting is a cool result in itself, based on a simple look at the DYFI responses. In areas with strong enough shaking to be “felt by nearly everyone” (intensity MMI 5) this demographic study finds that not quite 1% of the population submits a report to the USGS, a number that doesn’t change a huge amount with higher intensities. As you step down in shaking intensity from there, fewer and fewer people respond to the online questionnaire–on average 1 in 162 for MMI 4, down to 1 in ~500 for MMI 3, and 1 in ~3500 for MMI 2. Thus the method is limited to geographic areas with populations greater than ~5000, below which you would not expect to receive any reports anyway at lower levels of shaking. These rates of survey response may appear abysmally small (with “felt by all”-level shaking eliciting a submitted response from ~1% of the population, and intensities lower than that getting 0.62%, 0.19%, and 0.03%, respectively), but consider that in densely populated regions this amounts to tens or even hundreds of thousands of shaking reports–the densest coverage we’ve ever had in history to measure seismic ground motions. Even with these low reporting rates, Boatwright and Phillips (2017) claim improvement in the characterization of seismic attenuation through their accounting for not-felt non-reports. A great deal of promise exists in proactive platforms like the EMSC’s LastQuake app, which actively solicits responses in a shaken region using simple cartoons per shaking level, including a simple one-click option of not-felt. The cartoons used by EMSC to solicit eyewitness reports of shaking. Note that these include a simple option of Intensity 1, “not felt” and the survey is pushed to users of the App within the region of a significant quake. When equipped with the simple smart-phone app, up to 5% of people exposed to shaking will submit a response, including–thanks to the proactive solicitation of replies–a much larger portion reporting not feeling the quake. For this reason other agencies around the world, for instance New Zealand’s GeoNet, are adopting similar procedures to simplify response and feed information back and forth directly with users on smartphones. As citizen science and crowd-sourced information become more pervasive around the globe, it’s fascinating and valuable to more deeply interrogate these datasets to understand–and forecast!–ever better how earthquakes impact people. The following agencies operate online questionnaires for quake eyewitnesses (or those who didn’t feel one!). Pick your local one and support it when you ever feel an earthquake. Note that EMSC and USGS operate global databases. nice overview! To inform you, the current European situation to report an earthquake is way more complex that in the US where only the USGS manages the DYFI website. In Europe, there are even many more institutes that provide an online questionnaire than indicated in your list. As a result of this “fragmentation”, felt data of transfrontier-felt earthquakes are always scattered across different countries/institutes. This complicates the creation of reliable intensity shaking maps. FYI: In the open access paper (see link below) we tried to deal with this by merging intensities in grid cells and making grid cell intensity maps in stead of community maps. It is not ideal, but at least all felt data are grouped and it gives an overview of the felt distribution. In Appendix A almost all questionnaires available in Europe were listed. Good to see you found Croatia! I missed that one. Thank you Koen! In fact I just saw your article (and the blog post about it) linked to today! How timely. I’ll try and update the table. Do you have a sense of the relative contributions to each one? Do people prefer their local national service over a broader-reaching global one like EMSC? There is something wrong with the EMSC shaking cartoons, isn’t it? Hey thank you for highlighting this, Jorge. It’s naturally a bit difficult to identify all these different services in different countries, but this is a good resource. Maybe I’ll update the post to include it.